I can’t believe it’s only one week before my new Peacock Tail Bag CAL begins! And I am so excited about it. Seems like it’s right time to give you all the details about this project. If you haven’t chosen yarn and shades yet – that’s also the right time to do that. DISCLOSURE: This blog contains affiliate links. If you purchase a product via a link on my blog, I get a small percentage contribution from the store which enables me to keep providing you with free patterns. It costs you nothing extra to visit the store via my link, but ensure I get the credit for the sale. Thank you for your support! What is this CAL about? As you can see from the name and pictures this CAL is about a bag. From the very beginning I wanted it to look like a peacock tail. So I chose certain colors and tried to build exact shape. 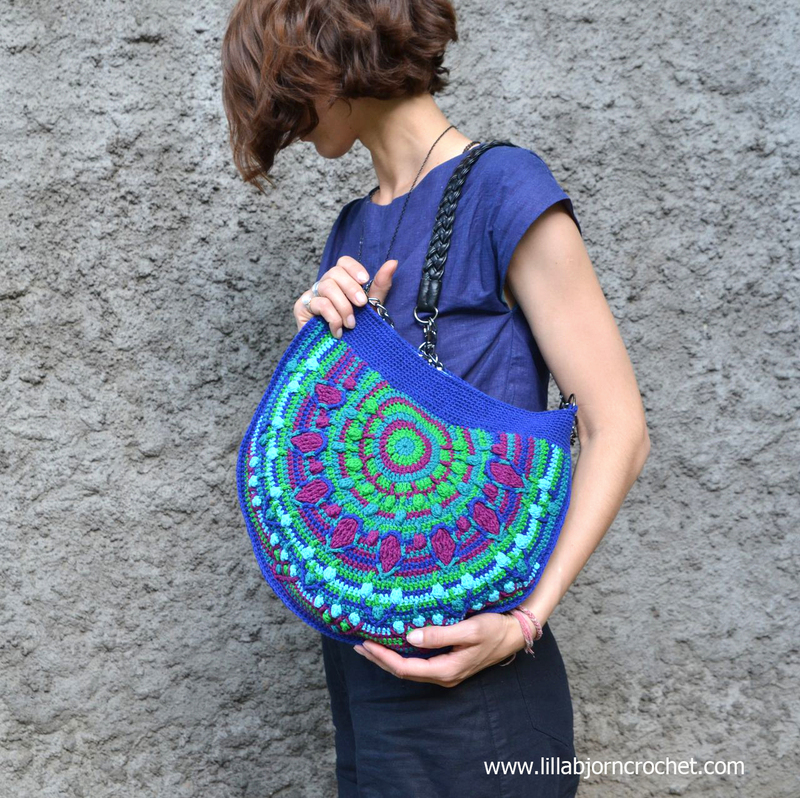 The front of the bag is made in overlay crochet technique and is covered with front post stitches and clusters. 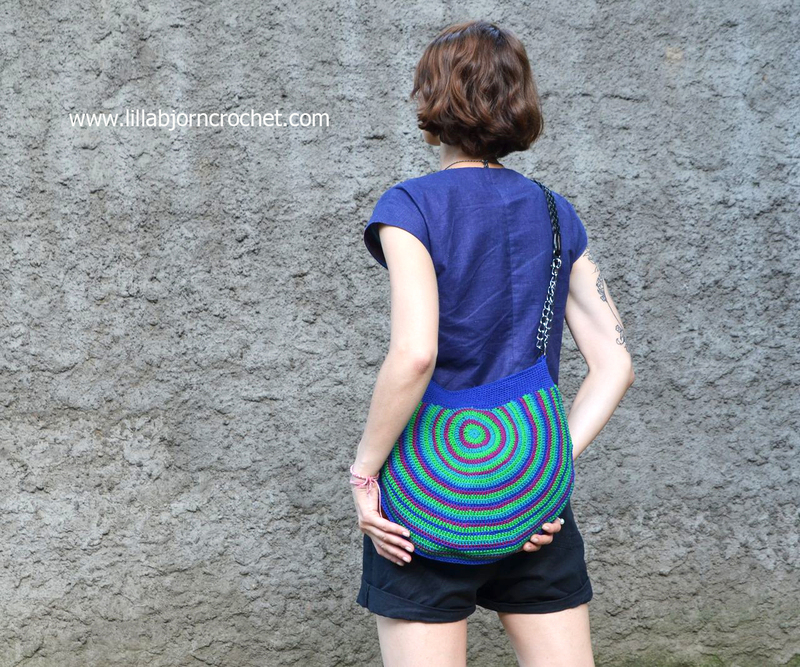 And the back is very simple – with colorful stripes. This bag has a fabric lining with small pocket and magnetic clasp. Adjustable strap allows to wear it as a cross-body bag or just over one shoulder. IMPORTANT: Please, be aware that all my patterns (free or paid) are protected by copyright. You are not allowed to copy, reproduce, redistribute, sell and edit them in part or as a whole. You are welcome to sell your finished items made by my patterns, but you cannot use my pictures to promote them. Please, always credit me as the designer of these patterns. You are not allowed to share pdf-files created from my posts with anyone. If you would like more people to join my CAL – please, share a link to my blog with them. If you own a yarn store and would like to sell kits for this CAL - please, contact me for details. You can check Copyright page for more information. Tutorials. Each Wednesday a new Part (detailed tutorial with written instructions and pictures) will be published here, on my blog. Around 4pm (Easten european time). Printing/PDF. You can find a green Print-Friendly button at the bottom of every post on my blog. You can use it to print the tutorials (with or without pictures) and also to convert them to pdf’s. If you are not sure how to use this button, please, check a very helpful tutorial HERE. Newsletter. If you haven’t done this yet, be sure to subscribe to my Newsletter not to miss a single beat of this CAL. I also offer a free pattern of Macaron Pin Cushion exclusively to my subscribers. If you have some problems with subscribing, please feel free to do it on any page of my blog. Facebook. Don’t forget to join my Facebook club. And be sure to check Official CCC Social Group which will host this CAL. Video. 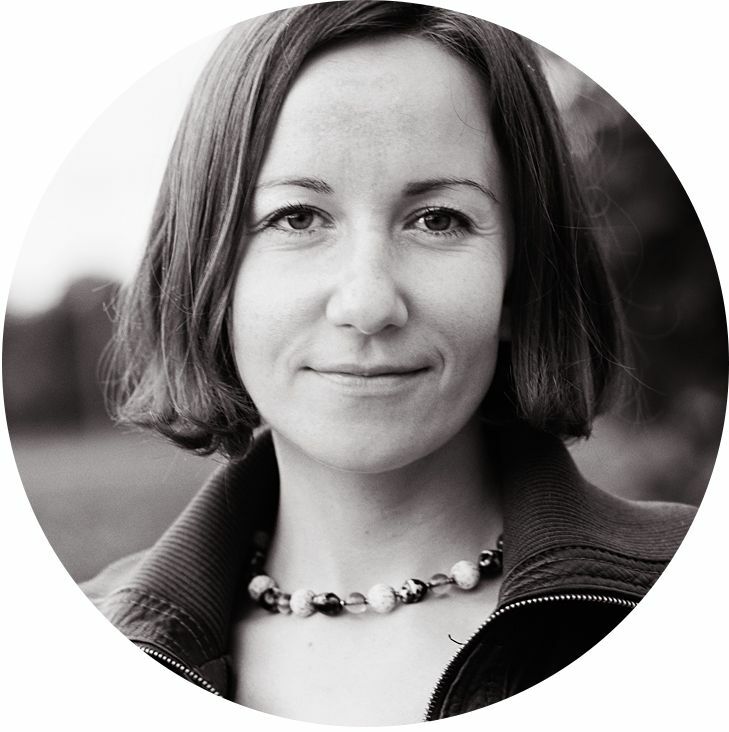 All videos for this CAL will be kindly recordered by Esther Dijkstra from It’s all in a Nutshell. You can view each video in the end of each post! Languages. This CAL will be translated into Dutch, German, Spanish, Swedish, Finnish, Danish, French and Hebrew. As planned at the moment, translations will be available for download as pdf files. I used Linen Soft yarn by Scheepjes in 5 shades for my bags (both Deep and Pastel version) – 6 skeins in total for each bag (two skeins of one “main” shade which is also used for the bag’s band). In my opinion, Linen Soft is ideal yarn for this project as it’s very natural in look and touch, the colors are rich and it’s also quite stiff. With just a perfect sturdiness for the bag. There are complete kits available for purchase at Wool Warehouse* HERE and HERE (international shipping). Each kit includes yarn pack, lining, bag handle, magnetic clasp, metal D-rings and white medium interfacing. The kits are being sold very fast, and new batch is in stock again (at the time of posting). !!! UPDATE: Because kits are so popular both types of lining were totally sold out. According to official information from Wool Warehouse, after current batch of kits is sold out - new kits will no longer be available for purchase via this retailer. But good news is that you can now purchase separately bag handles, magnetic clasps and D-rings HERE and create your own kits (with the lining of your own choice). Linen Soft is DK weight yarn. 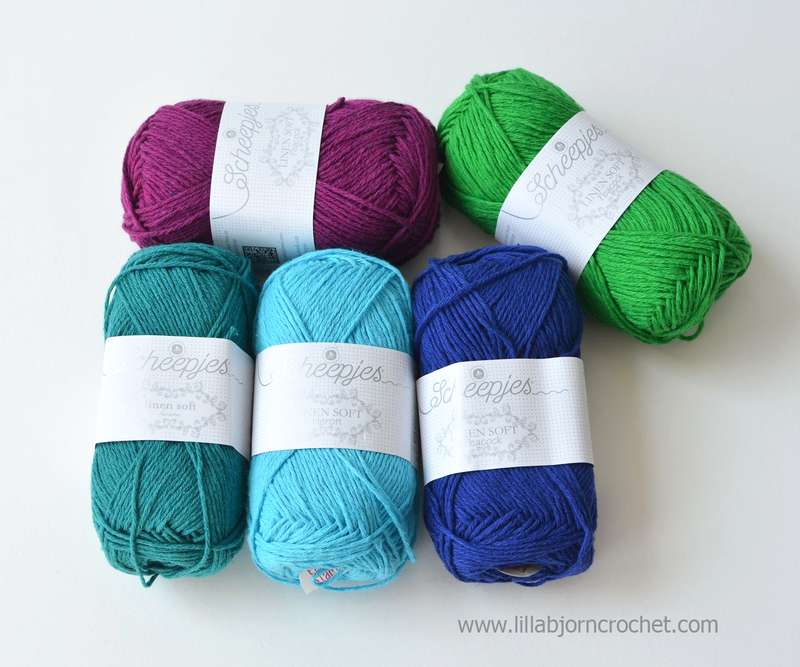 If you haven’t tried this yarn before – please, check my review HERE. If you would like to create your own colorway, you can use your own shades and purchase separate skeins on Wool Warehouse* HERE, Paradise Fibers* (US) HERE or in your local shop. If you intend to use different yarns - please, choose solid and contrasting colors to make overlay image vivid! You will also need a 2.75mm or 3mm (C) crochet hook. I used Clover Soft Touch* and am very happy with it. Exact size of your hook will mostly depend on your personal style of crochet and gauge (see Gauge below). US standard abbreviations are used in this pattern. But if you are used to other terms, please check this Crochet Translation Project which might be helpful in translation to your language. There will be detailed instructions about how to make every stitch given in the pattern for each week. Very often I am asked if this CAL (and overlay crochet technique in general) is suitable for beginners. This is a very difficult question and I am not sure if the answer really exists. Last year I wrote about my own opinion and you can read it HERE. 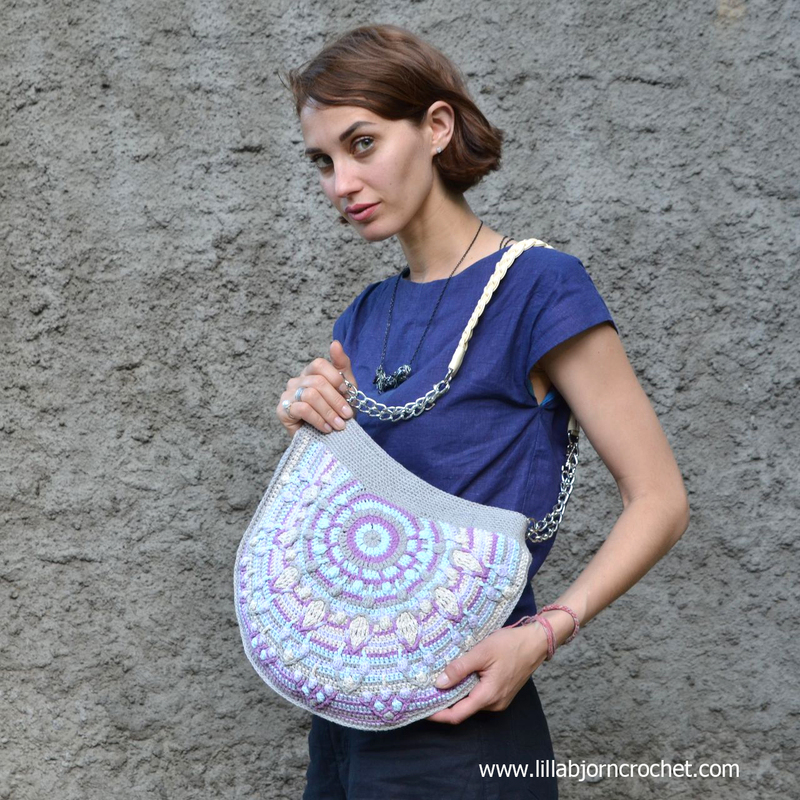 If you have never tried overlay crochet before – please, make sure to check Circles of the Sun CAL (HERE) before you jump into Peacock Tail Bag CAL. Please, make 2-3 squares using written instructions and video’s. This will give you a very clear idea of what my coming CAL will look like. You will get acquainted with the pattern style and special techniques. Like “needle join” for example. If you make several squares and feel confident with front post stitches, skipping stitches, keeping correct tension – then yes. 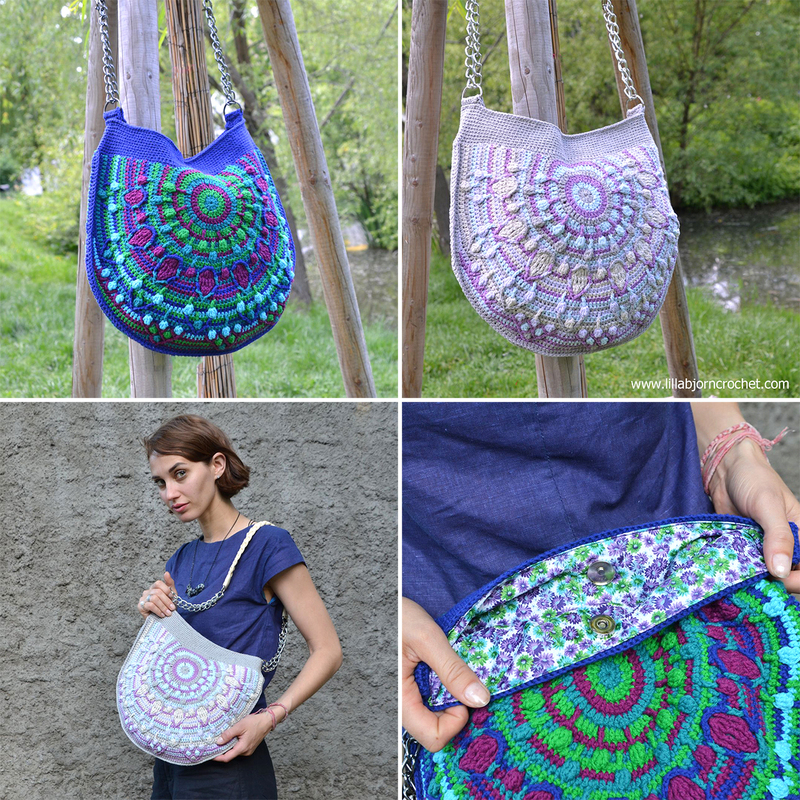 Peacock Tail Bag CAL is right for you. 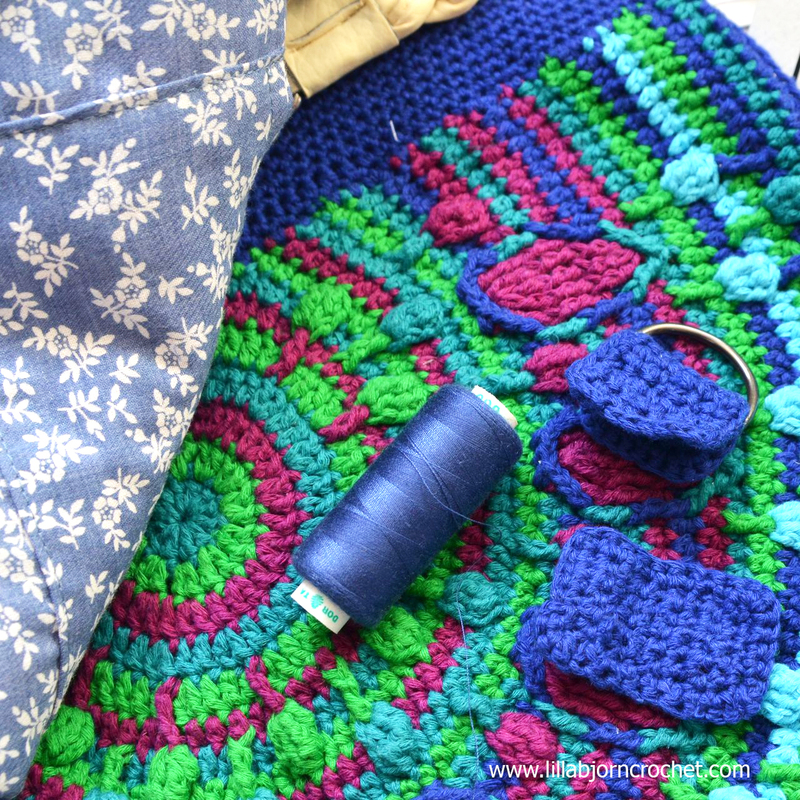 If you haven’t done this yet – please, check Overlay Crochet section on my blog. I published all the important information about this technique. I would recommend to you to have a look at it before you start the CAL. 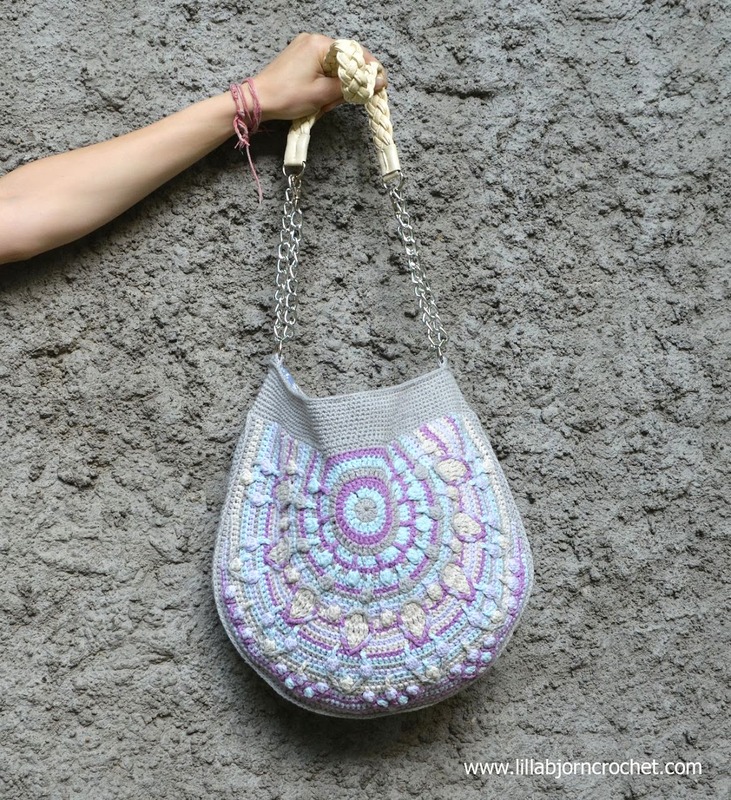 The size of your bag will naturally depend on yarn and hook you use. My bag is approx. 39 cm (15 ½”) wide in widest place and 35 cm (13 ¾”) tall. After 6 rounds circle with double crochet stitches measures 10cm (4”) in diameter. The gauge is important here in two aspects. 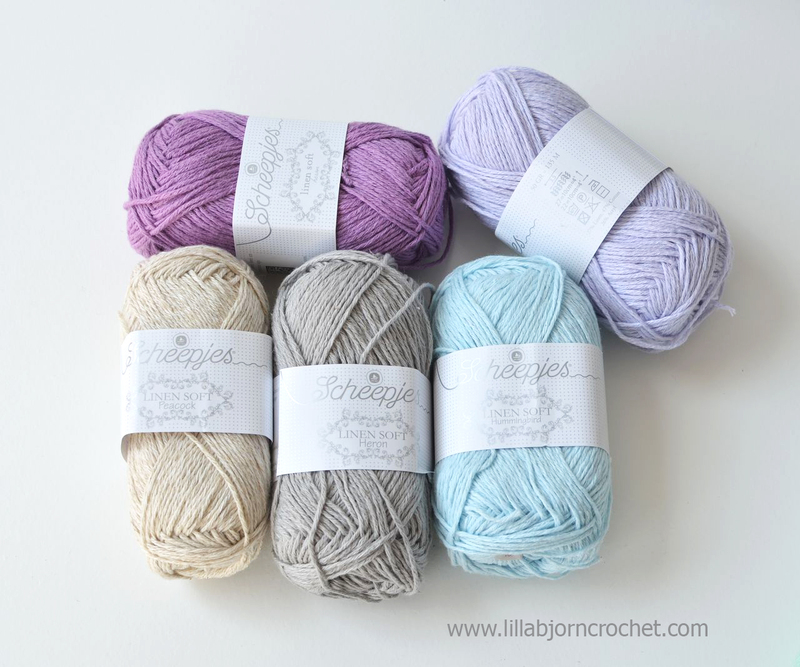 If you, like me, use Linen Soft yarn you should really keep an eye for gauge because if you crochet too loose, you can run out of certain shades and will not have enough yarn to finish the bag. Also you should be careful while making front post stitches – they are always made to the height of working round/row. They should not pull or be too loose. Feels like this is everything you need to know. If I missed something, please, don't hesitate to ask in comments below. I am unable to get the recommended yarn..i live in the Caribbean..any suggestions as to which i an substitute? Hi. It is 9:15 a.m. in US and I have not received week one yet. Also, how do I add to the Revelry que. Never did this before. 1st Part will be released at 4pm today (Central Europen time). Though next parts will probably be published 2 or 3 hours earlier. As for Ravelry, if you have an account there - just please go to the pattern page of Peacock Tail Bag and press the button "Add to queue". That's it. Hi, thanks for your reply. I didn't know the time zone difference. Can't wait. Obviously. what size of D-rings do I need? Thank you! As always, your tutorial is very clear and easy to follow - congratulations! Thank you Tatiana for sharing this great project with us! I am working the pastel colorway and I have just started row 13 (front). before I get too far I wanted to check that the color (C6) is the correct color, as the corresponding row on the back called for C10. Hi Theresa! the colorway for Pastel and Deep versions is not the same. and also colorway for front and back in each version is not always the same. If you zoom in the picture of a pastel bag you will see that I used C6 for row 13 of front part. Hi Tatiana! I love this CAL and all your designs. I can't print your PDF's. Have you heard of this problem with other crocheters? Hi Carina! No, this is the first time I hear about such a problem. Maybe try to download the file to your computer before printing? LOVELY PATTERN and easy to follow (both video and written) ! Hi Tatiana. What does NJ mean at the end of a row please? It is "needle join". Please, check Part 1 and you will find stitch abbreviations and link tot he blog post explaining hot to make NJ with a crochet hook. Hi Becky! Please measure width (in the widest place) and height of your bag, plus approx. 10cm (4in) to the width and 20cm (8in) to the height. And you will need 2 rectangles of this size. Strap length depends only on your personal preferences. Just choose the one you are comfortable with. Hi, I have just completed this bag and I have so enjoyed making it. Very many thanks for making this lovely pattern available - the bag has been much admired. Many thanks too to Esther, from "It's all in a Nutshell" for her excellent video instructions. Thank you so much for your extreme generosity in offering this free pattern! I love it! I've been crocheting on and off for more than 60+ years having learned from my Austria/Hungarian grandmother when I was very young. I fondly remember all the intricate tablecloths and doilies she patiently worked with her tiny hook and thin cotton thread! I always looked on in wonder. This pattern has inspired me to return to an art form I truly love, crochet, now thanks to you, modernized with one of my favorite designs of the mandala!! I especially love the colors and intricate design. Your directions are so good, and so informative, even for someone as myself who's rusty, has forgotten a lot and hasn't held a hook in a few years, I'm excited to dust off my hooks and get started! I also visited your Etsy shop and see even more inspiration! Once again, thanks so much for your kindness in sharing! Hi Barbara, thank you very much for your lovely comment! 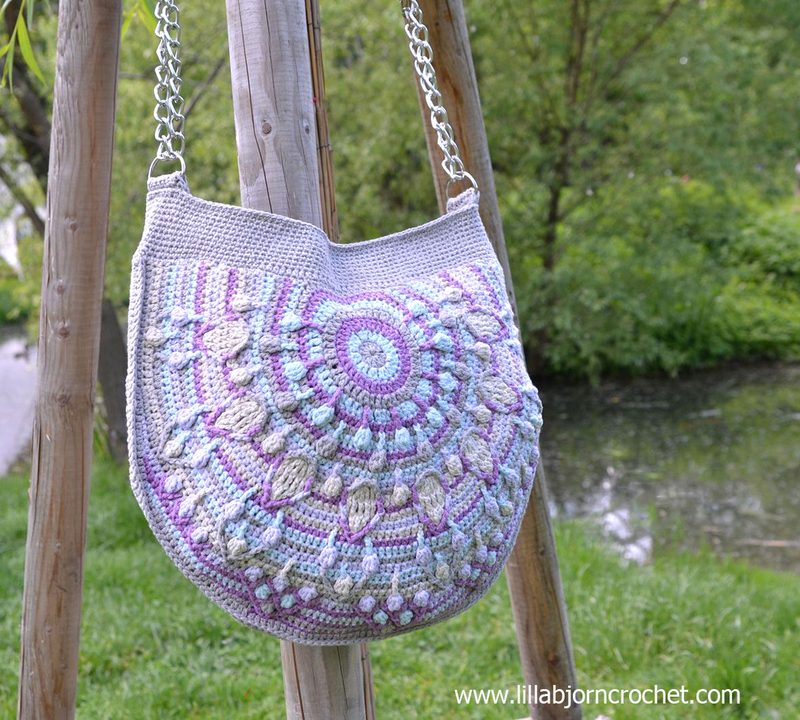 I am very happy my bag design inspired you to come back to crochet again.